As e-commerce booms in Russia, experts predict the trend will retain its pace for several years. Foreign online retailers have been actively developing the Russian market. 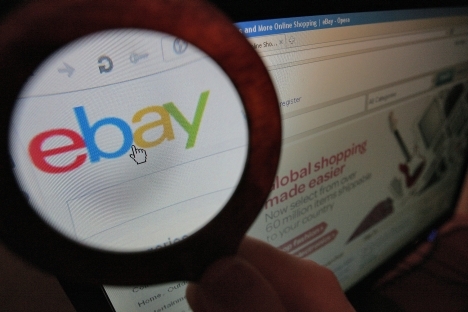 Notably, the world's leading online auction, eBay.com, made its website available in Russian in April 2013, in time to coincide with an advertising campaign on TV. According to an eBay source, the moves were all a part of a carefully weighed campaign to capture the Russian market. Foreign online stores have surged in popularity on the back of appealing prices and a wide choice of goods, information available to Data Insight suggests. According to the agency, in 2012, Russians put through 5–8 million cross-border purchases for their personal use; these sales were worth roughly $1.3 billion, corresponding to 16 percent of total tangible product sales and up approximately 50 percent from the previous year. Russia also made a step toward meeting foreign online stores halfway in May 2013. Russia's most used online payment system, Yandex.Money, reached a deal with the British online payment provider Skrill. According to Yandex.Money press secretary Asya Melkumova, the partnership with Skrill will link Yandex.Money to foreign online stores and ease access for Russian consumers to foreign shops. “Furthermore, foreign online stores will be able to promote their goods and services in Russia via Yandex. There is another important advantage: There will be no need for online stores to enter into separate agreements with the Yandex.Money payment system, and no extra costs will be involved in payment processing and additional integration,” says Melkumova. It is a win-win situation for online stores and Russian consumers, for whom this is a convenient way to pay for purchases. Russian shoppers have frequently run into problems with foreign stores rejecting payment with cards issued by Russian banks. With this recent deal between Yandex.Money and Skrill, payment processing is guaranteed for both stores and consumers. These recent steps illustrate most vividly the expansion of foreign online stores and payment services in Russia, as well as the proactive development of e-commerce in the country, in general. According to J’son & Partners Consulting, the Russian e-commerce market was expanding at an average annual growth rate of 29 percent in 2008–2012, which is higher than in Western countries. The U.S. e-commerce market, for example, rose 30 percent in the span of two years (2011 and 2012), rather than in just one year. Meanwhile, the boom is predicted to continue: J'son & Partners Consulting consultants expect the average annual e-commerce growth rate to hover at 10–15 percent in 2013–2017, bringing the market volume to 3.7 billion rubles ($112 million). Even so, Russia has much to make up for, with e-commerce only accounting for 2 percent of the total trade volume, compared to upwards of 10 percent with world's leaders – the United States and Great Britain. “The aggressive growth of e-commerce in Russia has been fueled by continually increasing levels of broadband penetration, as well as attractive pricing in online shops,” partner and managing director of The Boston Consulting Group in Russia, Bart Banche, said. The development of new, cheaper logistics models and the increased number of payment options have been additional drivers of e-commerce in Russia. According to the forecast by J'son & Partners Consulting, sales volumes at online stores driving e-commerce growth in Russia are set to increase from the current 400 billion rubles ($12.1 billion) to 930 billion rubles ($28.3 billion) in the future. The number of online shoppers is predicted to top 26 million by 2017, with consumer electronics, clothing, shoes and media goods topping the list of the most popular goods sold online. One of Russia's key features is the extensive use of electronic payment systems to buy goods and services on online outlets. As already mentioned, this is often linked to difficulties Russian customers are likely to experience in trying to pay with their bank cards. Some 60 percent of payments for goods purchased from online stores and various services are currently processed by electronic payment systems. By 2017, the share is predicted to shrink 49 percent, which will still be a relatively high showing. Will Russia be able to catch up with the world's leaders in terms of e-commerce? According to Banke, coordinated efforts by all key players involved – consumers, companies and the government – will be required to succeed with such an ambitious plan. “To facilitate strong growth of e-commerce in Russia, we need a further increase in broadband penetration in Russia in all the regions, development of the e-commerce infrastructure, boosting of public and private IT investment, as well as timely amendments to the current law to let both individuals and legal entities use the Internet,” says Banke.